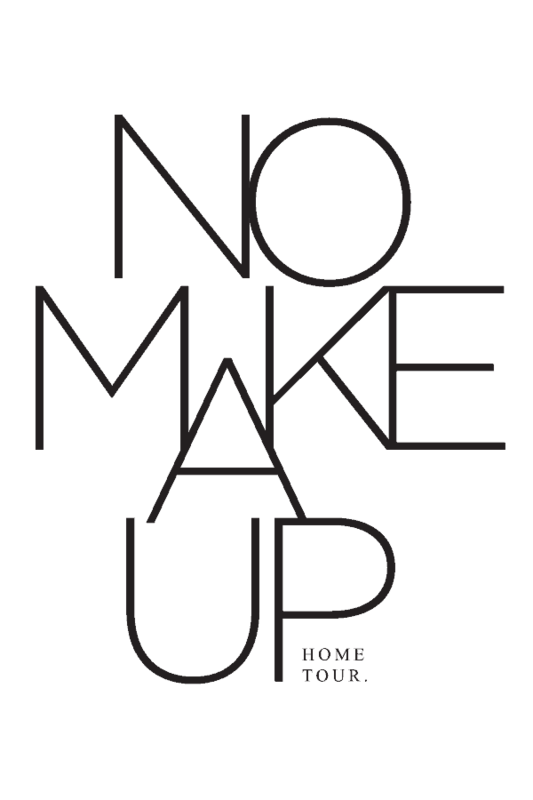 Have you ever heard of a “No Makeup Home Tour?” I’m guessing not! I hadn’t until Kyla from House of Hipsters talked to me about it. 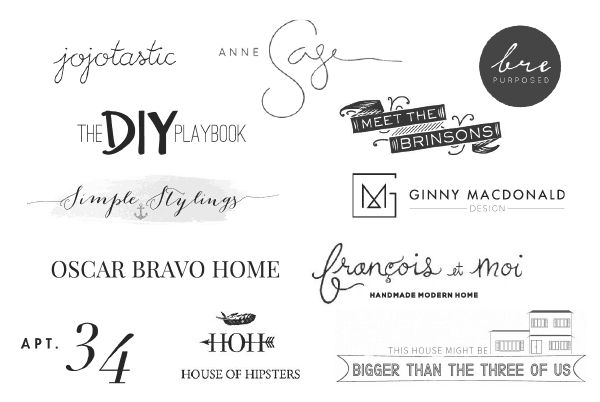 Basically, the idea of this “No Makeup Home Tour” is for a group of bloggers to share our homes all on the same day. BUT, that’s NOT all! Not by a LONG shot. The theme of this is to share what our homes look like without being picked up, perfectly styled and photographed at the best angles. 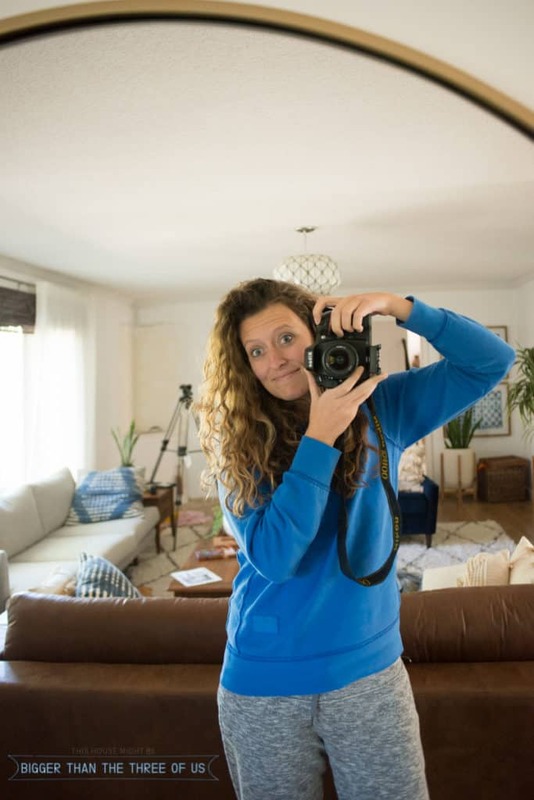 You want to see real homes of bloggers on real days? Well, this is your lucky day! Make sure to stick around after you’ve viewed my No Makeup Home Tour because I’m linking to some of my favorite bloggers at the end. Plus, if you are like me… it’s like inviting all our readers to be PEEPING TOMS. I’m always curious to see how other people live and if you are too, then this is the perfect mix for you. So, grab a cup of coffee and plan to stick around for awhile. Oh, and I just so happened to shoot this tour on a day where I was really deep-diving with blog work so you get a real, glorious look at my outfit for the day, too. I thought the no makeup on my face totally fit the theme of the day as well. Ha! So, let’s be real. I only have one child and he’s in school now. Before he started school there were toys everywhere; and you know the kind that I’m talking about. All those primary-colored Fisher Price toys, well those and cars and trucks of all sizes. Now, though, he’s in school most of the day and in after-school activities. So, toys aren’t really hanging out all over the house. Instead of toys, we have soccer stuff and swim team bags. We have blog equipment and renovation samples that I’m looking through. All of that plus the general house stuff, like dirty/clean dishes, books, shoes, etc… you know the normal things. Our house, in general, stays decently picked up because it’s only me at home, most days, working in my office. Then, I hate to admit it, but we have a house cleaner come once per week to clean the bathrooms, floors and dust. So, all of that combined keeps the spaces pretty clean. That said, whichever room I’m doing a project in is usually a hot mess. That room right now is the living room. We’ve been traveling so much that a small little project like finishing mudding the walls has taken a few weeks. So, the video tripod, the lights, camera equipment and project tools are constantly out. I’m way too lazy to put them all up and then bring them out again so they just stay out until a project is completed. And, let’s be real here… this project started the last week of Sept. That’s about three weeks of the living room looking like this. 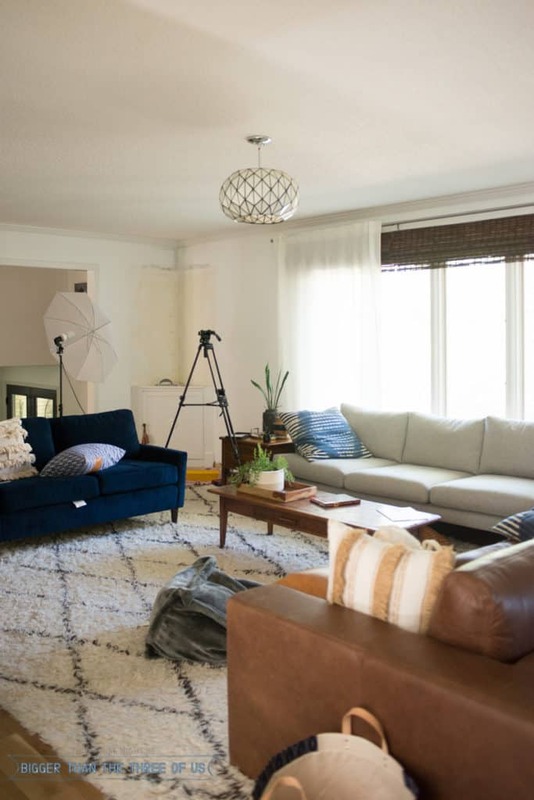 The pillows… well, we actually use our couches so the pillows are always in disarray unless I’m shooting the space or people are coming over. The dining table usually has a piece or two of homework. Underneath the barstools usually have a pair of shoes and a backpack or a swim bag, but today, it looks like the swim bag is sitting on the dining chair. And the only reason there isn’t a backpack and shoes under the counter is because school isn’t out for the day. 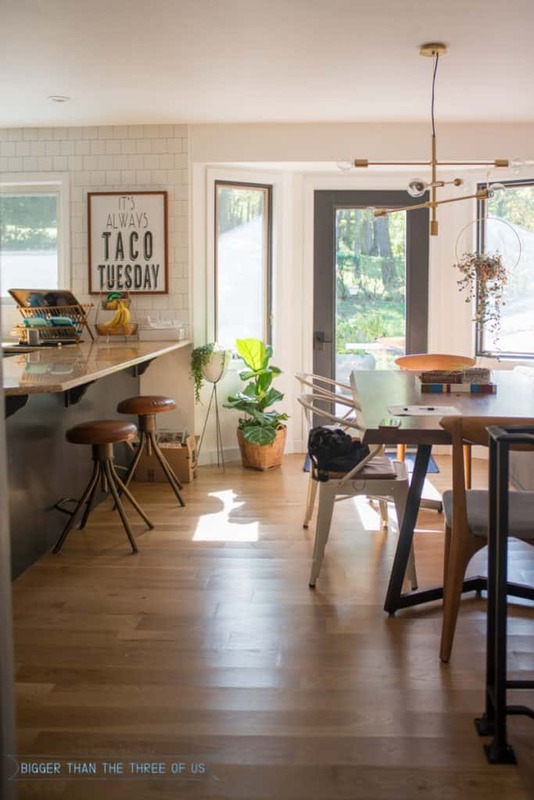 Clean dishes are usually drying on the rack and packages that are delivered get stashed below the taco print (click to buy The Taco Tuesday print) or underneath the counter. And fruit never looks adorable in the fruit basket. I think those styled shots where fruit looks good are crap. Or, it’s fake fruit. Or they are only buying fruit that matches the decor in the space. Something like that. Our fruit basket is always overflowing and it doesn’t add to the decor at all… it’s just a fruit basket that we use. Most days, the counters in the main part of the kitchen stay pretty darn clean, other than the drying dishes. Counter clutter gets on my nerves so it’s one area where we tend to pick up. Well, unless it’s the weekend and we are being lazy. But, this shot is pretty normal for us. 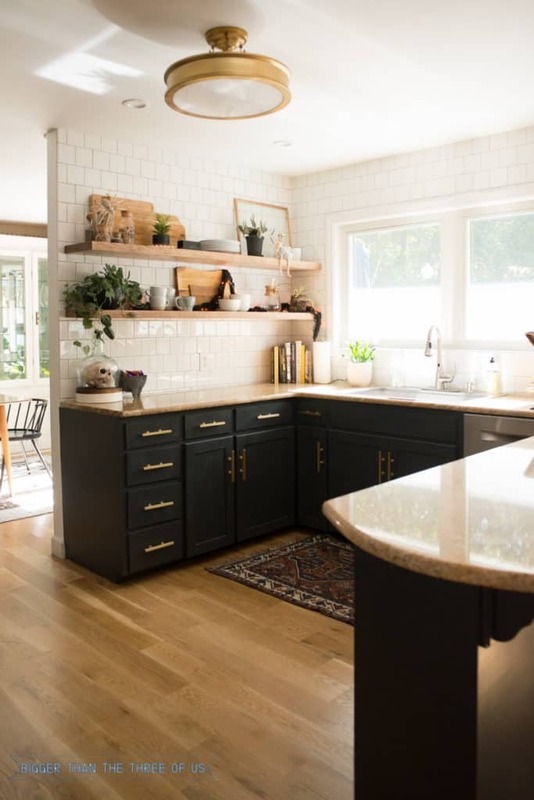 Now, if you were to tiptoe closer to the sink… you’d probably see dishes in the sink. Ok, not probably… you’d definitely see dishes in the sink. The sink is DEEP though and that’s a HUGE bonus. You have to be on top of it to know that there are dirty dishes in there. Can you spy the tile on the table? Those tiles have been sitting on the table since August. 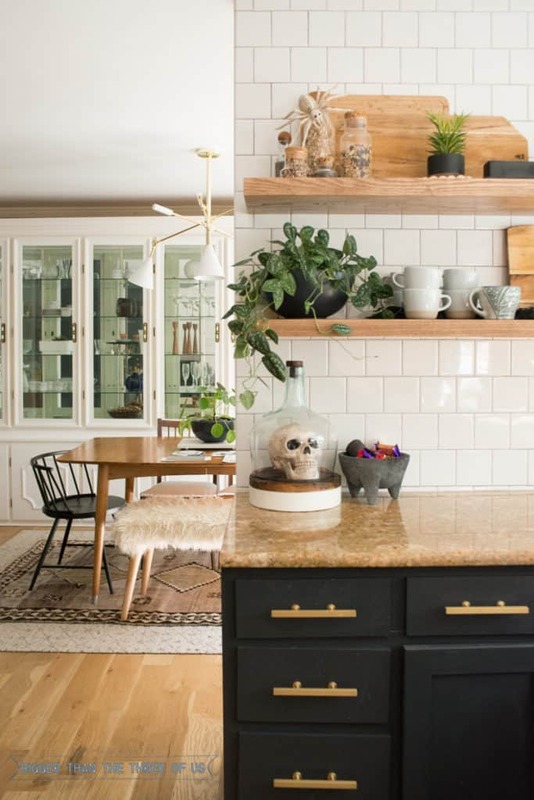 I’ve been trying to decide on tile for the powder bath and, for some reason, I just keep them there. 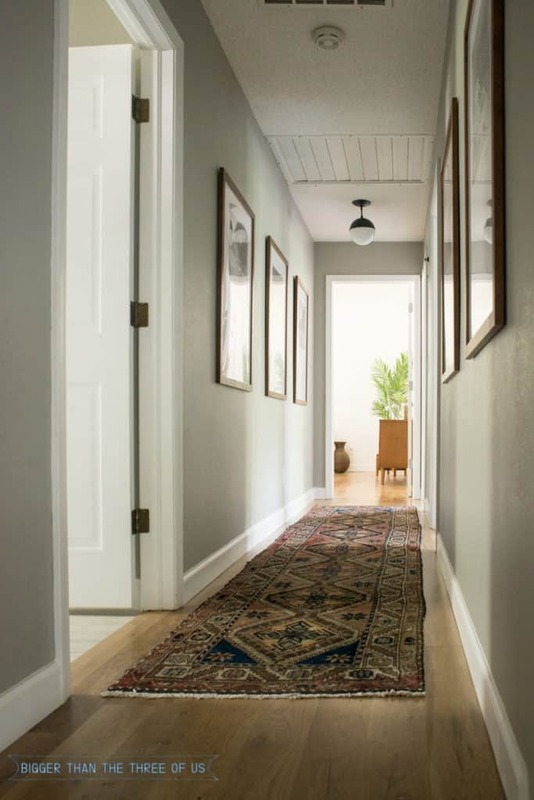 I just revealed our hallway makeover. Did you happen to see the full before/after? If not, go check out the Travel-Themed Hallway Makeover with a full video how-to for cutting your own picture mats. Anyways, the hallway doesn’t get cluttered. You might step on a small, forgotten Lego every once in awhile but, other than that, it’s always tidy. I’d fall down the stairs if there was clutter in the hallway, wouldn’t you? Or maybe that’s just me being clumsy? Who knows! 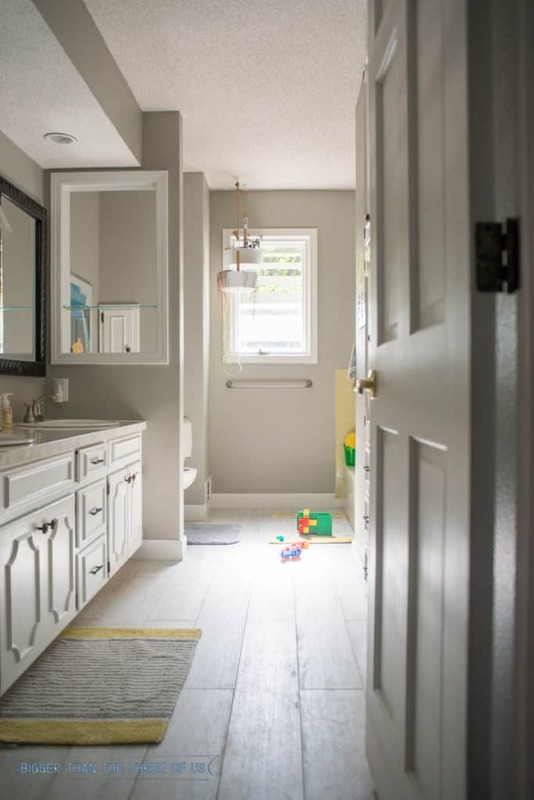 This is our kiddo’s bathroom which also serves as the main bath for guests. There’s almost never a hanging towel on the rack, the succulents have been dead in the lowest hanging planter for about two months now and there’s usually dirty underwear or bathtub toys somewhere on the floor. Overall, the kiddo keeps it pretty clean because it’s on his chore chart but it’s never picture-perfect. Today, it looks like you were spared the dirty underwear – yay you! But, it’s seriously 50/50 on the underwear laying in front of the toilet. Why? Seriously, all he has to do is throw them down the laundry chute. 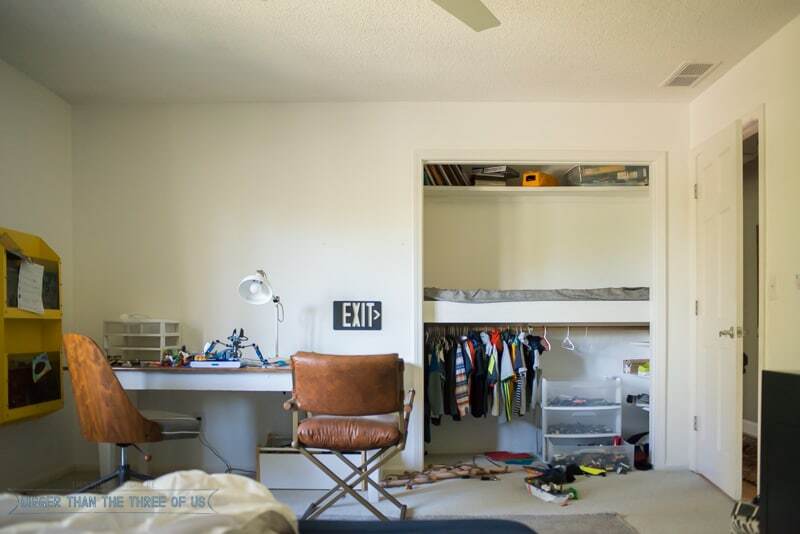 If you go further down the hallway, you get to Greyson’s room. 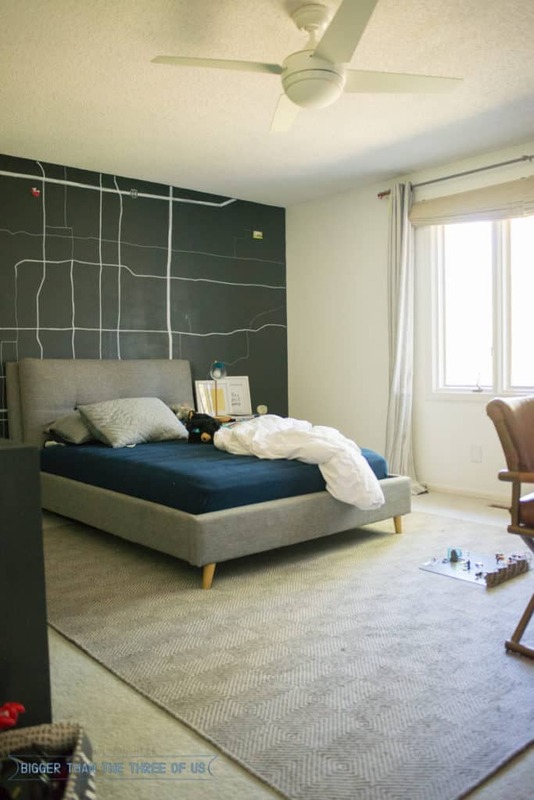 His room is funny because it’s either decently clean (like today) or a complete hot mess. But it doesn’t look different day-to-day. It will be clean like this for a few weeks and then all of a sudden, it’s a complete hot mess. It’s weird! So, you might be appalled to know that I still call this angle of the room clean. 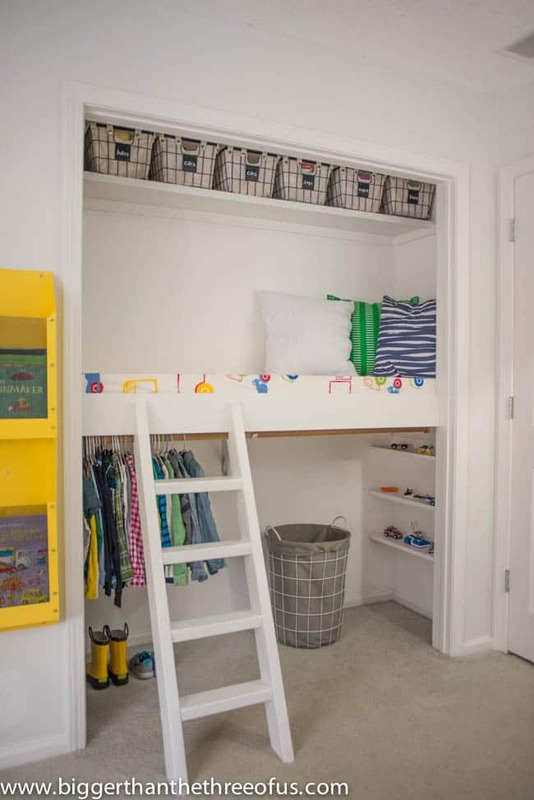 Yep, the DIY Closet Loft no longer looks that cute! We took down the ladder a few months ago and got a climbing ladder to put up but have never put it up. Our lego collection has filled about every basket and bin that we have so we had to move another plastic bin into the room and we put it under the loft for easy access. And guys, this room is pretty CLEAN right now. The master bedroom (see the master bedroom reveal with sources if you are curious to know where I got what) stays clean and I make my bed every day. 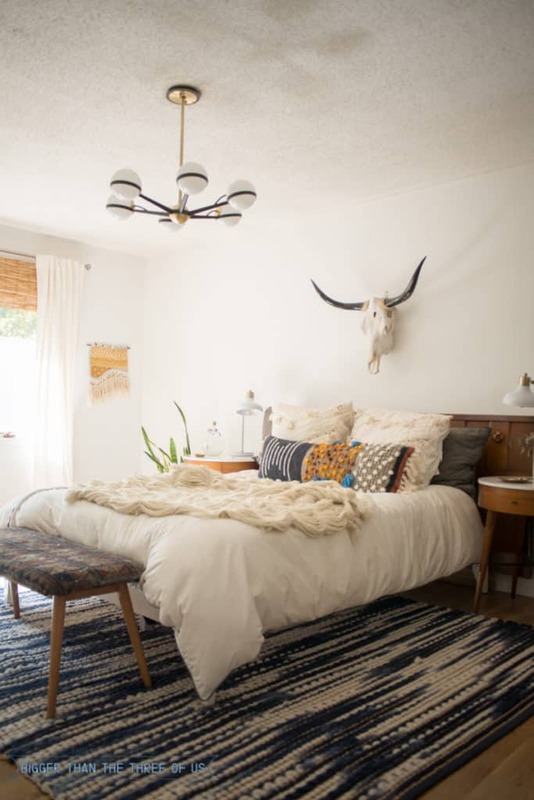 It’s calming to me to have the bedroom clean so it’s just something I do in the morning. Pick things up and make the bed. It seems to work for me. 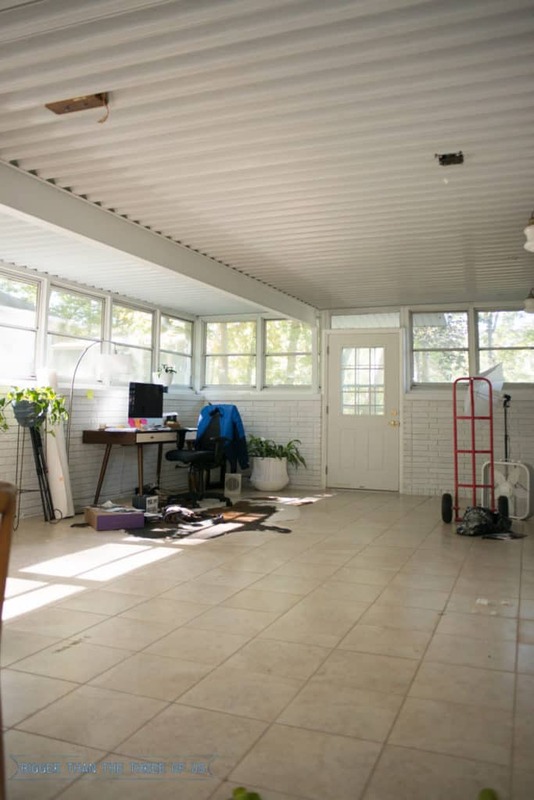 Let’s go check out the messiest room of the house… my office/sunroom. I moved my desk into the sunroom about two weeks ago and it’s been an AMAZING change. The light the space gets is calming and inspiring and I love having the desk out of the library/playroom space. I go to the office to “work” and for some reason, I feel much more productive. The space on the other hand, is a hot mess. We are still waiting on a mini-split install and then after that will come overhead lights, a bit of electrical work and then some organization. BUT, this is it right now. So, is my home the messiest ever or do you think it’s pretty normal? I can’t wait to hop around and see the other tours to see what everyone else normally has going on.